Whether we’d like to believe it or not, it’s technically Spring. For those of you on the West Coast or somewhere beautiful / tropical / happy, you probably don’t know why I say this, but New York is really in a funk right now weather-wise. Nevertheless, the sun will (hopefully) eventually come out and it will be what I like to call “highlighter season.” Yes, you can wear highlighter year round, but Spring and Summer is the best time to really get the “luminizing” effects out of it. Highlighter, like a good mascara helps awaken the face and more often than not, a little goes a long way. If you’re someone who isn’t very big on makeup, a simple highlight is often times all you need. If you do, however, love makeup a good highlight can be the perfect finishing touch. First, let me cover the different types of highlighter — matte and luminous. I happen to use both. A matte highlighter is often times a lighter concealer that can be used under your eyes to brighten the face. Whereas a luminous highlighter, with shimmery reflective particles, is often used on areas of the face that hit light the most– like cheekbones, to give your face a nice glow. My go-to concealer for highlighting under my eyes is the Sephora Bright Future Concealer ($14) in the shade Toffee, which I’ve mentioned in a previous post. It is just light enough to naturally brighten my under eye area, without looking like I put a ton of makeup on to do so. 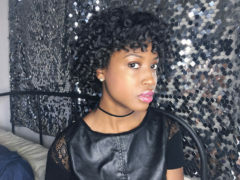 When picking a matte highlighter for simply brightening the under eye area it is generally best to go about 2 – 3 shades lighter than your current skin tone, no more than that. This will blend much better with your current tone and give a natural uplift to your face. When it comes to a luminous highlighter, this is where the fun starts. As mentioned, luminous highlighters have tiny particles that reflect the light off of them, giving a shimmery glow to certain parts of your face. Luminous highlighters come in numerous forms — cream or stick, powder, or liquid. I personally prefer a powder formula because it stands out the most and is the easiest to apply. However, for a even more natural glow I’d suggest a cream / stick or liquid luminous highlighter. They blend well with your foundation and if you aren’t wearing any, look the most natural against your skin. Some of my favorites of each are the Fenty Beauty Killawat Freestyle Highlighter Duo ($34) in Lightning Dust and Fire Crystal (powder), Glossier Haloscope ($22) in Quartz (cream / stick), and Red Earth Secret Potion Illuminating Skin Fluid ($35) (liquid). *As a treat to my readers, Red Earth is giving you 15% off if you use the code XOaishabeau at check-out! The key to finding the right highlighter shade is somewhat similar to that of selecting the right foundation — you must go by your undertone. Reason being, highlighters are supposed to give the “your skin, but better” look and shouldn’t stray too far from your particular pigmentation. There are three types of undertones — warm, cool and neutral. For those with a warm undertone, it is best to wear more golden and bronze hued highlighters, whereas someone with a cool undertone would look better with silvers and pinks. I personally lean on the neutral / warm undertone categories, and love a champagne colored highlighter — which is the most versatile in my opinion. Once you’ve figured out what colors and products you want to use to highlight with, the next step is actually doing it! For under the eye highlighting using a matte concealer it is best to use the triangle method, which is quite literally making a triangle under your eyes with the product and then blending it out from there. If using a liquid or creme matte concealer, I’d suggest blending it out with a sponge tool like a Beauty Blender ($20). When using a luminizing highlighter, I like to apply to the areas on my face that the light hits. 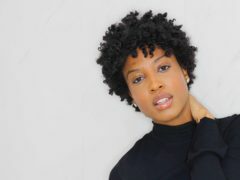 This gives a nice glow and enhances your natural bone structure. So that means applying the product to your cheek bones, tip of your nose, and chin. Some add to the forehead, but I am a naturally oily person and like to skip that step ;). For all three I like to highlight my cheekbone by making an “arrow” if you will, on the sides of my face. Starting along the cheek bone and working my way outward and up above the brow bone. From there, I add any excess onto my nose and chin. *to note, the good thing about a liquid highlighter is that if you are weary about applying too much directly to your skin, you can always mix it with another product. So for a more subtle look, add a few drops of this to your favorite foundation and apply! There you have it, a step by step on getting your summer glow on! Let me know if you found this helpful and what your favorite highlighters are! *As a treat to my readers, Red Earth is giving you 15% off if you use the code XOaishabeau at check-out! 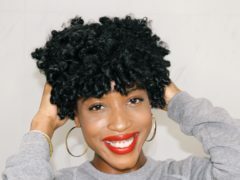 How To: Perm Rod Your Short Natural Hair / TWA! 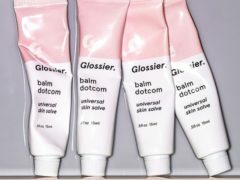 So Excited to Announce that I’m Now a Glossier Rep!